Ge Quanxiao felt a little relieved as he returned from a United Nations forum on hydropower and sustainable development in Beijing in late October. Ge, a villager from the Wuzhu Village of Jinsha Township in Southwest China's Yunnan Province, was invited to speak about his concerns over the construction of a proposed hydropower station near his hometown, together with four other immigrants from dam areas in the province. "I have made the voice of my countrymen heard by people in all walks of life," he said. 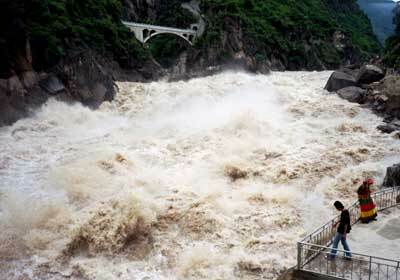 To ease the power shortage in Yunnan and its neighbouring provinces, a dam has been proposed for Hutiaoxia, or Tiger Leaping Gorge, on the Jinsha River, a main section of the upper reaches of the Yangtze River. According to Xinhua, the report for the hydroelectric planning on the middle reaches of the Jinsha River has been approved by the National Development and Reform Commission, which listed Hutiaoxia project as one of the recommendations. Yet its feasibility study, including assessment of its environmental impact, has not started yet, according to Chang Zhongnong, an official with the environment assessment department of the State Environment Protection Administration. If the project is carried out, nearly 100,000 residents will have to move out, said Yu Xiaogang, a river region management expert and head of the Yunnan river region management centre, a non-government organization based in Kunming, Yunnan's capital. Ge's village, with 4,000 residents, is less than 90 kilometres from the chosen site of the Hutiaoxia hydropower station. If the station is built the village will surely be submerged. Acknowledging that the Chinese Government has always given high priority to the proper settlement of relocated immigrants, Yu agreed that many previous relocations forced by the construction of new dams did ultimately help residents with few resources shake off poverty. That, however, may not be the case in Hutiaoxia, he said. According to Yu, Ge's village is located at the most fertile part of western Yunnan Province. The local government has pledged that relocated people will be properly compensated and settled. Yet, Ge, 58, said he is quite happy to stay in his hometown. "My fellow countrymen are living quite well here and we are not poor at all," Ge said. His family earns between 30,000 yuan (US$3,620) and 40,000 yuan (US$4,800) each year from toiling in the field and is much richer than most of China's farmers. He said his level of income is normal in his village. That is not the only reason he opposes the hydroelectric project. He also believes that for him and other local villagers, a plot of fertile land is more sustainable than a hydropower station. A station may work for 100 years, but a piece of good land can be cultivated throughout generations, he said. At the forum, Ge tried to express his attitude towards the Hutiaoxia project to as many people as he could, including government officials. The government should include local residents in the decision making because they are entitled to live and use the land, he said. Ge told China Daily that he is not against all hydropower stations. but building one in the Hutiaoxia region, a spot famous for its beauty and the home to an integrated culture made up of many ethnic groups, might be just too costly. It is dangerous not to give enough priority to issues related to environment and migrants during the construction of dams, said Zheng Yisheng, an environment and development researcher with the Chinese Academy of Social Sciences. Any problems that arise, if not solved properly, endanger the stability and sustainable development in the southwestern region, where many hydropower stations are planned to produce a large chunk of hydroelectric energy from rivers in the area. Zheng said one solution to the problems brought on by relocations is to ensure immigrants are in the know and can have a say in the construction of the dams. Management expert Yu said residents are affected most by hydropower stations. As compared with developers or government, many such residents are usually disadvantaged. "If no representatives of the residents are allowed to participate in the construction process, it will be hard to guarantee their interests," Yu said. Yu also suggested assessing the social impact of the projects before construction, ensuring local residents take part in the assessment. "It is not that we oppose the construction of the hydropower station. What we advocate is that everything should be decided after thorough communication and negotiations among the government, enterprises and the general public that might be affected," he added. China's hydroelectric reserves stand at 700 million kilowatts, 40 per cent of the its total conventional sources of energy, according to the latest statistics of the National Development and Reform Commission. The country will put priority on hydroelectric projects as part of its sustainable development strategy to reduce pollution resulting from burning coal, Zhang Guobao, vice-minister of the commission said. Although China's hydropower exploitation potential ranks first in the world, its utilization ratio is still very low at 24 per cent, Suo Lisheng, vice-minister of water resources, said. "In developed countries, the figure is often more than 60 per cent and even as high as 80 per cent," he said. To meet the needs of China's developing economy in the next 20 years, power supplies, especially hydropower, will be developed rapidly, Suo confirmed. During that process, however, authorities will be urged to take the environment into account, Suo promised. Overall planning, design, operation and management of hydropower projects will be done in an environmentally friendly way, commission sources said. Although the economic importance of hydropower plants cannot be underestimated, their construction also has brought inevitable negative effects on the environment, officials and experts admitted. Large-scale hydropower projects usually force tens of thousands of locals to leave their homes to make way for construction, change river courses, cause sedimentation and water quality can deteriorate. Plants may also change local climates, induce geological disasters and threaten the original ecological environment along river basins. As one of the best optional renewable resources of the world, hydropower will nonetheless continue to play a key role in promoting many countries' sustainable development, eradicating poverty and improving human life in the years ahead, many participants agreed. However, its adverse impacts on environment must be mitigated. The issue has evoked increasing debate since the 1990s and has even slowed construction of some large dams since then.